The stick is firm and well-made with a triple cap. The guillotine cut was effortless and clean. This connecticut has the requisite pre-light scent of hay and some earth. Pre-light draw is perfect; plenty of draw but just enough firm resistance so that you feel like you are drawing a cigar and not a giant straw. Toasted and lighted with a single flame torch; the first taste is cedar and sweet hay and the finish is short. 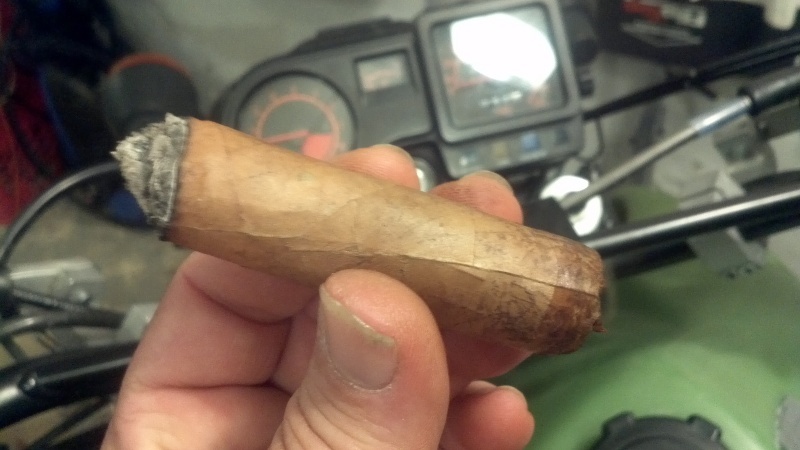 After the first half-inch smoke production is average, resting smoke is wispy but satisfactory. First third was pretty mild as expected for most Ecuadorian Connecticut wrappers but had good flavors of cedar and earth with a slightly sweet overtone. The mid-point yielded more robust flavor notes and added a bit of spice. I don't usually retrohale as the pepper tends to overwhelm me and doing so here really showed off a white pepper that gives me the same sensation you get with wasabi. This is a plus for those who want more complexity out of this cigar and like to do so. The last third of the stick brought the strength of the cigar to the medium spectrum and the tobacco flavor become a lot stronger and the finish was longer. This was a solid connecticut that had plenty of flavor. It was no cedar bomb but had plenty of interchange of cedar and earth, and it lacked the minty undertones that is prevalent with many other medium-bodied connies. While this makes for a less complex stick, it makes for a great change-up if you smoke connecticuts and gives something more straight-forward for any time of day you want to smoke it...even post-breakfast. Sweet review. Sweet pics to go with it. Great review, I got similar flavors out of the one I had. I thought it was a nice, high quality cigar and I'm glad I smoked it but ultimately I think I won't buy more of them. For the price point there are more complex milds out there in my opinion. Excellent review and great pics. I've only had the E.P. In a Maduro, but you've convinced me to give the Connie a try. Nice job! E.P. Carrillo has never made a bad cigar imho. +1. I was so disappointed when I had to put down the E.P. Maddie I was enjoying Saturday because some genius fell getting out of their car the night before and decided that their back was hurting... I shall have more!! Great review. The New Wave I had this summer was very similar except that I picked up the light spiciness all the way through. I recall almost like a tongue numbing, tingly feeling without a big blast of pepper. Thought it was a pretty cool cigar but ultimately didn't get a box. I'm looking forward to trying the Maduro, that sounds really good! My favorite Connie right now is the LGC Retro. The flavors and spice are different and a bit unusual but I really enjoyed them. Have more coming in a day or two. I don't think I will be able to get them all home to the humidor! I stroked one of these last night while preparing tobacco leaves in the garage.It was a real pale stick that smelled like grass and tasted milky. It uncapped rather ragged, requiring some surgery. Drew creamy unlit. Lit bitter. Had to wait for it to mellow. Once it did, it settled into mild leather and delicious cedar. It would get harsh if I hit it too hard. Otherwise, creamy grass, light leather, and cedar. Not much smoke while resting, so I did not get a good garage aroma. Halfway along, it cranked up the cedar until at about a third left I started spitting. The ash was very loose. The burn was perfect. It left me with an ugly mouth but a delicious stinkfinger. I had to toss a generous nub and brush my teeth. Enjoyed the stinkfinger for another couple hours. Morning mouth was decent. Left me a wet wheeze.